I go through phases of passion for peanut butter. Some weeks or even months I'm kind of meh about it. Cause peanut butter is a commitment. It's sticky and dense and once you swallow it, you've pledged to carry a rock inside you for the next half an hour. A really delicious, satisfying but oh, so heavy rock. And the thirst. A very urgent sense that if don't drown your mouth immediately with water that you will suffocate. Death by peanut butter. It's probably not the worst way to go but still. And then sometimes, like lately, I just want to smuggle the jar out of the fridge, grab a spoon and go hide out in the closet. Go away, children. There is peanut butter and I am busy. Peanut butter cookies are devious because they give me all of the peanut butter taste and temptation with none of the peanut butter problems. Especially these peanut butter cookies. My Mom used to make peanut butter cookies. Probably the same ones your Mom made. The ones you crisscrossed with a fork dipped in sugar. And there's nothing as appealing as an old-fashioned cookie that reminds you of your childhood. But here's my issue with those cookies. They were more crispy than chewy and they tended towards dry. They were great softened in a big glass of milk. But I'm an adult now and frothy glasses of milk make me shudder with disgust. And there is. Behold. A soft, dense slightly chewy pile of peanut butter cookie dusted with sugar. Once you try this recipe, you will never turn back. These are not your Mom's peanut butter cookies. And that's a good thing. (Sorry, Mom but it's true.) Love is a peanut butter cookie. One that stays soft, sweet and just chewy enough to provide texture without any of that crumby mess that equals dry cookie in approximately 20 minutes of cooling on the counter. These peanut butter cookies are delicious and reliable- a perfect match. I think I'm in love. Caramelized oats sound fancy, but they are just oats crumbled with some coconut oil and honey. They get caramelized in the over when these cookies bake and oh my goodness. It's how miracles are born. More on that later. I know. That dough looks on the verge of crumbling apart. Don't even worry about it. It's going to be fine. You'll see. See how that worked out? But don't go getting all dreamy-eyed on me just yet. Pop these little bites into the oven for a few minutes and let them set on the sheet to cool off for awhile. No need to get all hot and bothered just yet. This recipe hails from Julia's album, where I tinkered with it a bit and added in the caramelized oat idea from my favorite Half Baked Harvest Muffin recipe. I will be forever grateful to Julia for this recipe. I hope you'll try it and feel exactly the same way. Take a moment to whip up a batch of these this weekend and fall in love again with a classic. Preheat oven to 350 degrees. Using an electric mixer, cream peanut butter and butter in a mixing bowl until smooth. Add brown sugar; beat until combined. Add an egg and almond extract, and continue beating until creamy. In a separate bowl, whisk together flour, baking powder. Gradually add dry ingredients from step 2 to wet ingredients in step 1, beating on low speed. Prepare baking sheet by lining it with parchment paper or lightly greased aluminum foil. Place granulated sugar on a plate. Roll spoonfuls of cookie dough into balls, rolling each ball between your hands. Roll into 1/3-1/2 inch balls in sugar to coat them completely. Place cookie balls 2 inches apart on a prepared baking sheet. Using fork, depress slightly. Toss oats with honey and coconut oil. Crumble about 1/2 tsp. onto tops of cookies. Bake until cookies begin to puff up slightly, about 12 minutes, until cookies just brown around the edges and crackle on top. Remove from oven and let the cookies cool at least 10 minutes on baking sheet before transferring cookies to rack to cool completely. 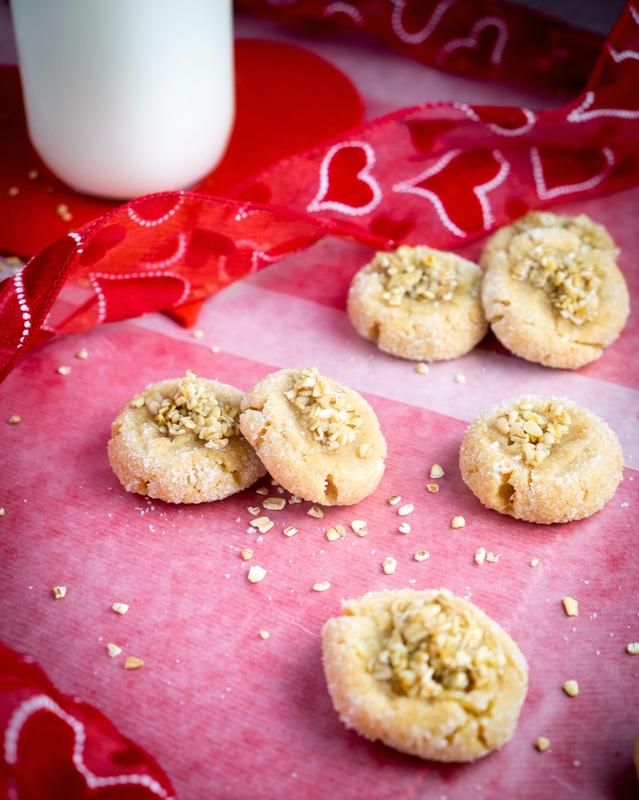 Is this peanut butter cookie your idea of the perfect partner? Come see more pairings on A Sweet Little Life.